Home / Missionaries / Asia / Why Coal? Why coal? We can see the need for food for the hungry, medicine for the sick, and even mosquito nets. But coal? In a city with an air pollution problem? The truth is coal is an imperfect solution to a deadly problem. The cold in Mongolia is killer. By this time in the year we have entered what locals call the ‘nine nines’, a stretch of nine, nine-day periods which mark the coldest time in the year. The daily temperature ranges from five degrees – on a warm day – to thirty below. The nights become much colder. For those who live in apartments in the city center, the cold is just troublesome. It means dressing in warm layers and hurrying from building to building to stay out of the biting wind. Their homes are warm thanks to the government-provided heating system that dates back to the communist times. But for those who live in the gers sprinkled throughout the city or in the sprawling ger district, the story is quite different. It’s strange to stand in someone’s yard and look out over the city skyline just miles away yet know that people here have unstable power, no running water, and no central heating. They have cast-iron stoves to cook on and provide heat. However, wood is scarce and must be purchased from suppliers who travel to far away forests to harvest it. 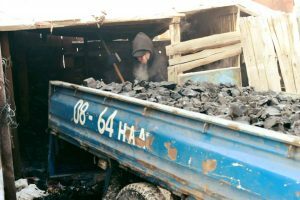 Coal is the main fuel used in Mongolia. It’s coal that warms families and cooks their food. It’s coal that fills the sky with clouds of grey and black soot which settles onto every surface turning it dingy. 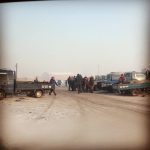 I am frustrated – along with all Mongolians – at the dependency on coal and the horrific health problems it can create. So you might ask the question I first posed – why coal? Why are we feeding into the most debated problem in the country? If you were able to step inside one of these homes, duck your head under the extremely low door lintel, and sit on the small stool that would be offered to you, it would make sense. If you were to watch a young child of five huddle near the stove holding out shaking fingers only to realize that there is no heat coming from the stove because there is no fuel to burn, then you would want to fill that stove. If you were to watch a woman pile every blanket in her possession over the sleeping form of her two-month old baby in a desperate attempt to keep her warm, you heart would want to provide a means of warmth. If you could just be here, I know that like myself, you would not hesitate to purchase as many truckloads of coal as possible. This project is reaching out to those who have no resources, no support, and no hope, and we are telling people that God loves them so much that He sent money all the way from America just for them. I wish you could see the smiles on their faces and hear first-hand their words of gratitude. Instead, let me pass on their thanks – because of your generosity, many people can sleep in comfort and safety tonight. Thank you!